BANGI, 8 September 2014 – Cultural heritage is the essence of a country and its people and thus ASEAN as a grouping of nations needed to nurture for the evolvement of a strong ASEAN identity and intercultural relations. The Founding President of the Institute for Democracy and Economic Affairs (IDEAS) of Malaysia, Tunku Zain Al-Ábidin Ibni Tuanku Muhriz believes that the diverse cultural heritage found in all the ASEAN countries should be celebrated and embraced. He was speaking at the ASEAN Youth Volunteer Programme (AYVP) here recently focusing on the theme of the conservation of heritage of a nation and its people. A total of 50 youth leaders from all the member countries are taking part in the five week programme hosted this year by The National University of Malaysia (UKM). It ends on Monday Sept 15. The programme focuses on the “Development of ASEAN youth heritage leaders through Volunteerism and Community Engagement”. The objective is to enable the participants to acquire knowledge and understanding of the regional identity, its culture, values and the development of its socio-cultural community. Tunku Zain Al-Ábidin the Founding President of the Institute for Democracy and Economic Affairs (IDEAS), Malaysia, gave a talk to the participants here recently on the role of civil society in an organisation that is moving towards an ASEAN Community by 2015. Recognising that the countries within ASEAN have very diverse cultural heritage, Tunku Zain Al-Ábidin said such a situation will not only improve race relations within each country but will also help towards nurturing better relations between the member countries. Cultural heritage is the expression of the ways of living developed by a community and passed on from generation to generation. As part of human activity, heritage produces representations in their daily lives. He said physical cultural heritage consists of built environment, natural environment and artefacts while folklore, language, values, nursery rhymes and oral history are part of non-physical aspects of culture. The richness of culture and history that is shared by all the countries in ASEAN – Malaysia, Indonesia, Brunei Darussalam, Vietnam, Thailand, Philippines, Laos, Myanmar and Cambodia – is what binds them together, Tunku Zain Al-Ábidin said. He believes in a strong ASEAN community that is supportive, respectful and forward thinking and the forging of unity among the ASEAN countries would be the goal of their youth. As future leaders, they will decide how ASEAN will fare in the coming years. “The real success of ASEAN depends on the people. 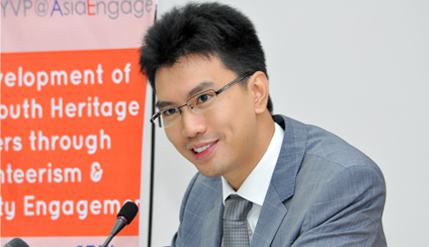 You are the living embodiment of ASEAN ideals and volunteerism best represent ASEAN’s civil society,” Tunku Zain Al-Ábidin said. The future of ASEAN will be in the hands of the youth of today and they must be able to be leaders of tomorrow to lead, protect and carry on the culture, language and heritage of their own individual countries, he said. The participants, he said, represent their countries and their heritage as well as being the future of ASEAN. He also touched on how ethnic identities has been politicised for all the wrong reasons merely to achieve personal gain by some politicians thus rendering ethnic identity a sensitive topic in most ASEAN countries of late. Tunku Zain Al-Ábidin said that the people needed to know that there is nothing wrong in celebrating all of the various aspects of their identities. Celebrate the fact that you are of a certain ethnicity but also rejoice that you are of one nation and also embrace your ASEAN community. He also reminded them that modern democracy of every ASEAN country do not mean the removal or destruction of historical or cultural heritage. “History and culture is what makes our countries unique. Our values and traditions of the past have helped built our countries and our ASEAN community of today. Never forget your history because to forge a better and brighter future, you must learn from and value your past. You are the leaders of the future but never forget the leaders who came before you, their strength and sacrifice is what our countries are built on,” Tunku Zain Al-Ábidin said. Deputy Vice Chancellor (Industry and Community Partnerships) Prof Dato’ Dr Saran Kaur Gill who is also the Executive Director of AYVP@AsiaEngage, attended the talk. Prof Saran Kaur said that the students’ journey through the AYVP programme would require them as volunteers to acquire multi-disciplinary knowledge, be organised, disciplined and committed. Their participation will test their skills of working within a team, understand the needs of others and respect different cultures, she said.